Every month, I write columns for two local magazines – the Hawkesbury Parish News and the Tetbury Advertiser. Both of these publications are lovingly put together by hugely experienced volunteers for the benefit of the local community. The papers combine articles by local people and community groups with affordable advertising opportunities to help local businesses attract new customers. Both publications plough back any profit into local good causes and charities. They contribute significantly to the well-being of their local communities, both by enabling effective local communications accessible to all (and not just to those on the internet) and by improving local facilities and services – factors which are particularly important in rural areas such as ours. Such magazines may also be significant and much-needed customers for local print companies. 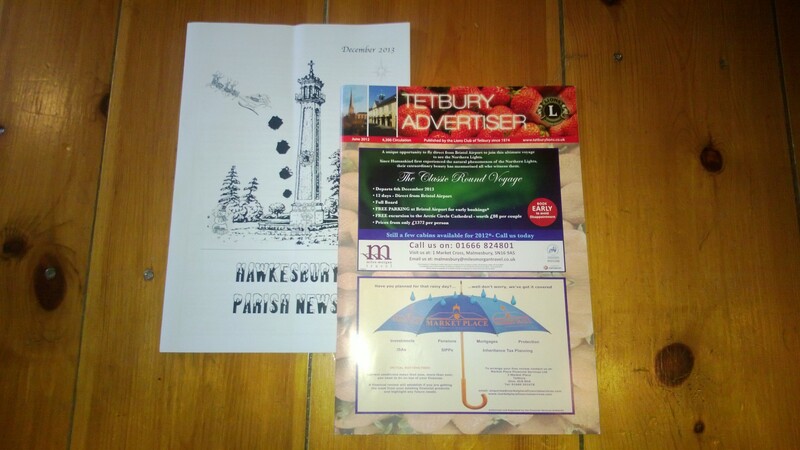 Impressively, they manage to keep the cover price of both papers low – Hawkesbury Parish News costs just 40p an issue (which includes free delivery by hand to your home) and Tetbury Advertiser is free. Thus not even a housebound pensioner on a small fixed income with no internet access need ever miss out on feeling a part of their local community. Even if they never get out to take part in any of the many local activities featured in these pages, they will still feel like they are part of the community. If I were in charge of the New Years’ Honours List, the volunteers who dedicate an extraordinary amount of time and effort into putting out these publications would not go unrewarded. One might be forgiven for wondering whether in this internet age, which threatens the viability of so many local and national newspapers, such magazines might be on the wane. A few years ago, working for a local private school that was trying to discover the most effective advertising media , I undertook a survey of the school’s current pupils parents to discover which were the best read newspapers and magazines in their households. I expected to learn that upmarket newspapers and glossy magazines were their favourite – The Times and the Financial Times, perhaps, plus Country Life, Country Living and Tatler. I was pleasantly surprised to find that the papers of which they were least likely to miss an issue were local community magazines such as Hawkesbury Parish News and the Tetbury Advertiser. It’s not surprising that both of these publications have been gaining size, strength and readership year on year. As you’ll have guessed, I’m proud to support and write for both of these great publications. To make my articles available to a wider audience, including the Hawkesbury and Tetbury diaspora, I post them up on my author website a week after each print issue will have landed on people’s doormats. To suit the interests of their readership, these articles usually relate either to the time of year or to local activity in our part of rural Gloucestershire. So here’s my first column for HPN in 2014, which manages to do both at once. In an old notebook, I recently discovered a list of New Year Resolutions that I’d written down about 15 years ago. Although I don’t remember making the list, the resolutions were familiar, being pretty much the same ones that I make every year. Why the repetition? Because like most people, I never manage to keep my New Year Resolutions beyond the end of January – though as an optimist, I never fail to make some. Happy New Year to you all, however you resolve to spend it! * HU5K is the Hawkesbury Upton 5K Fun Run which I help organise to raise funds for the village school. It takes place the Saturday before Father’s Day each year, and 2014 will be the third annual event. For more information, please visit its website: www.hu5K.org. Next Post Blog Chain: What Am I Working On?